The Critical Thinking Co.™ is aptly named as it is my 'go to' for logic and critical thinking curriculum. This month we reviewed Something Fishy at Lake Iwannafisha as a team with my 16, 13 and 10 year old. The entire book is a 'whodunit' mystery that we needed to solve. We tend toward mystery type shows when we sit down together as a family. The kids referenced several of them as we were talking about this review for Something Fishy at Lake Iwannafisha. It was not necessary for them to have watched any of these type of shows in order to use this book. The first item given to the detectives was a great amount of back ground and forensic information to process. The Forensic Evidence Lessons included Anthropology, Arson, Ballistics, Counterfeit money, Autopsy, Handwriting Analysis and Fingerprints. There was over 20 pages of lessons to read up before getting started. I did take the lessons directly out of the book with the perforated pages and gave them to the kids in a file folder. Some of the worksheets can be printed off online through a link in the book, but not all of the pages. There will be a few here and there you need to scan a copy of to have a complete set. After the kids read through the evidence lessons we got started on the story. They had to list evidence they found, and how it may be applicable. They decided who they may need to interview, and what type of evidence they needed to look for. In the book I had additional information to give to them when they asked for it. They wanted to jump right in and figure out all of the crimes, and I had to help them stay focused and not jump to conclusions. This was great in having patience and working together as a team. This particular book is geared for grades 5-12. That great range allowed for our larger family to work together and I really feel they enjoyed it as a team. 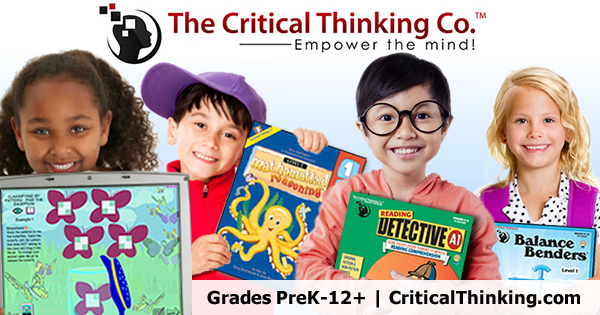 The Critical Thinking Co offers logic and critical thinking curriculum for all ages. You can search on their website for a specific grade and age or even for a specific topic. They also have curriculum for language arts, math, science and social studies. As I am gearing up for a new school year, I enjoyed looking through the website to find additional tools to use to work with my kids. I really think it is a great idea to have some critical thinking built in to each year. I think some times this skill gets over looked, and The Critical Thinking Co is trying to remedy that with their great line up of tools! My Crew mates had a selection of books to review. Click on the banner below and find additional reviews for Something Fishy at Lake Iwannafish as well as several other great products shown below. Find The Critical Thinking Co on these social media sites.